You would think golf practice nets would be a pretty simple concept across the board, right? The problem I was having with my old practice net was that it was not simple in the least. The instructions were complicated and it came with more parts than a Lego set. On top of that it claimed to be portable but when it was collapsed down into its bag, it took up almost my entire back seat. I used that thing for a year before I got fed up and hit the market for a better one. 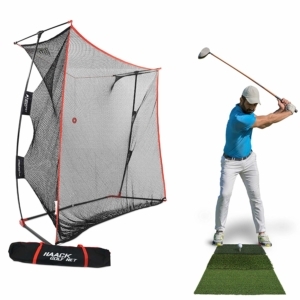 All I wanted was a simply designed golf practice net that I truly could take with me anywhere. So far the Rukket Haack Golf Net has more than delivered. If you are anything like me and value a sleek and convenient design then do yourself a favor and continue reading my review for this practice net. The ability to practice anywhere is important to me as I sometimes find myself with a bit of downtime at home or at the office. The Rukket Haack has been great towards that end so right off the bat, if you are the kind of golfer that likes to get quick shots in wherever and whenever you can, this could be a great call for you. First of all it is not too bulky. When broken down into its included carrying case it is about half the size of a fully loaded golf bag and weighs only about 20 pounds. When it is set up it stands at 7 feet high 9 feet wide and about 3 feet deep which means I can set it up in my office. I live in the Pacific Northwest and it rains a lot here. I needed a golf net that could stand up to both rain and wind and the Rukket Haack net has done just that. It comes with ground stakes if you want to practice outside and secure it to the ground and the best part is that you can leave it outside. The frame and stakes are sturdy so it doesn’t flail about even in high wind and I can leave it out in the rain because the 4-ply nylon net is weatherproof and the stakes and poles are water-resistant. I was really excited when I saw that the Rukket Haack Net came with its own hitting mat that featured 3 different types of turf: fairway, rough and tight. The net is large enough that you can practice everything from wedge to driver shots. I typically stand about 6 feet away from the net and wail balls into it with my 9 iron. It can stand high velocity shots as well so I practice my drives pretty frequently with it. This is not the kind of net that you will need an engineering degree to set up. The frame tubes feed into each other easily and the vertical poles are collapsible. The net design is pretty intuitive as well. It is easy to tell which sleeves are to be attached to which frame ends. The whole process takes me about 3 minutes.